When you are betting on sports, what you are really betting on is the scoring. So, the more scoring there is in a particular sport, the more bets there are to make - and the more profit opportunities exist. It is easier to make money betting on basketball, since it has so much scoring, compared to sports such as hockey and soccer, which have much less. Basketball offers the typical bets offered for all sports - over/under, moneyline, spread bets - and props (at the better sportsbooks, such as Bodog. These bets are available for the quarter, half, and the whole game.) The basketball-specific bet that is most popular is the "Race" bet where you can bet on which team will be quickest to get to 40/50/60 points. The sportsbooks removes the "quarter" and "half" bets when there are about 2-3 minutes left in the quarter. The "half" bets serve as "quarter" bets during the 1st and 3rd quarter. In other words, if there is no 4th quarter bet offered by the sportsbook at the start of the 4th quarter, you can simply take the "2nd half" bet (for either the spread or moneyline) at the then-current odds, and this serves as a 4th quarter bet. Since basketball has so much scoring, you have to be very careful about placing live bets because the odds change so often. To read more about this, I highly recommend reading my live betting page. Be careful of scoring adjustments by the officials. Sometimes, a team will hit a shot that you can tell will be reviewed - either a shot at the buzzer or a 3-pointer where the shooter's foot appeared to be on the line. In these cases, the points are usually posted to the scorebaord and then the referees will review the play during the next whistle. Then, there may be points taken off the board. Be more careful when placing bets during these times because you may be placing a bet on a score which is about to change. It can also affect a bet you have already placed. I have had this happen to me, which you can see in the example below. 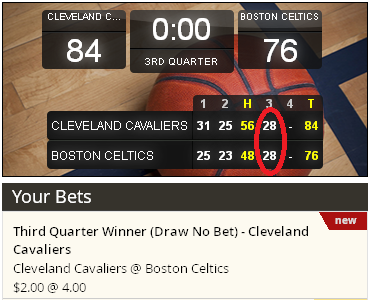 I placed a bet that the Cavaliers would outscore the Celtics in the 3rd quarter. The Cavs had outscored them by 1 point after hitting a 3-pointer at the end of the quarter, and were up 85-76. But that 3-pointer was changed to a 2-pointer, so the 3rd quarter ended in a tie at 28-28. "Garbage Time" can considerably influence a game's scoring. Not only do completely new players enter the game when the starters all sit down, but the players entering the game play much harder than the starters did because they rarely get to play, and they want to take advantage of their rare playing time. These bench players are much harder to get a read on because you don't know them well, since they rarely play. Also, the final minutes of a blowout game often lends itself to the winning margin getting narrowed considerably because the losing team often scores a lot of points by hitting a bunch of quick 3-pointers. This dynamic is compounded by the fact that the winning team is playing according to an unspoken rule that they won't try hard to run the score up further, and therefore, don't try to score. Get to know the different team "personalities". For example, Lebron James is a player who often paces himself when he plays. Therefore the teams he plays for (The Heat, and then the Cavs) also pace themselves. This leads to unique opportunities that can be exploited. In Lebron's case, you'll often see his team go down by a large amount (say, 20 points in the 2nd or 3rd quarter), and the odds offered for his team to comeback offer large payouts. When Lebron (and his team) decide to "turn it on," his team usually comes back hard, and bets on his team pay off well since they offered such previously-generous odds. The optimal number of bets per game, in my opinion, will usually be between 0-3 - and sometimes up to 5 if a game has a lot of swings. The more competitive a game is, the more difficult it will be to make money because there will be fewer betting opportunities. Games where there are baskets traded back and forth where neither team takes more than 4-to-6 point lead throughout the game will be harder to profit from. This will happen more often when disciplined teams are playing, such as the San Antonio Spurs. Also, Game 7s during the playoffs tend to stay close games that just go back and forth. Information about basketball you share very well. I will share this useful information. I hope you will have more useful information to share with us. Thank you for your tips, I will share this article to my friends who always bets in basketball. A dentist who will help take care of your teeth, see Emergency Dentist in Clapham Junction. Make an appointment.